Chasing steelhead is one of my favorite kinds of fishing. One of the reasons I enjoy it so much is because it marks the beginning of spring. The weather is finally warming up and there are lots of animals to observe at the river. I also love steelhead fishing because the fish fight like a smallie on steroids. They make numerous screaming runs and put on a dramatic aerial display. Just writing those words gives me the itch to get out on the river! If you haven't pursued steelhead, you need to give it a try. Steelhead, also known as "chromers," are just giant rainbow trout. These rainbows are anadromous, or migrating trout - meaning that they spawn in freshwater rivers and streams, move out into the oceans to forage and grow, and then return freshwater rivers to spawn. Unlike salmon, trout do not die after breeding but return to their spawning grounds year after year (a good reason for catch and release). Steelhead have been introduced to many water bodies outside their native range, including the Great Lakes, because of their popularity as table fare and the fact that they are fun to catch. They were also brought to the Great Lakes to help control the population of alewife (an invasive species). There are five different strains of steelhead swimming in Wisconsin's waters. Arlee, Kamloops, Skamania, Chambers Creek, and Ganaraska are stocked yearly. This variety in strains extends the fishing opportunity for shore anglers because of the fact that they spawn at slightly different times. For example, Skamania start coming into the tributaries in fall while Chambers Creek fish show up in spring. Much of steelhead fishing is about timing. Snowmelt and the occurrence of spring storms result in varied water levels. High river levels mean that steelhead can swim upstream to their spawning grounds, seeking out gravel in cold oxygenated water. Females fan silt off of the substrate and release their eggs which fall into interstitial spaces within the gravel. Simultaneously, males are lined up along side and behind the female depositing sperm to fertilize the eggs. The eggs will continue to develop and eventually hatch provided that the eggs aren't covered up by silt and the water remains cool and oxygen rich. In Wisconsin there are virtually no streams that are suitable to natural steelhead reproduction and that is why the WDNR spends so much time and money on the annual stocking of trout and salmon. The general principle is steelhead come into rivers when there are high flow rates. Fishing is best as the river rises and after it has gone back down. In some rivers you can fish when water is at its peak, but this is not the norm in Wisconsin. If you scout around long enough you can probably find a break in the current where water is slow enough to fish during these times. The real problem is visibility. If the steelhead cannot see your bait and the river is raging, odds are you will not catch them unless you physically hit them in the open mouth. Fishing techniques vary quite a bit depending on water temperature and whether or not the fish are spawning. Steelhead migrate into Lake Michigan tributaries during high water events but do not spawn until water temperatures approach 42 degrees. The majority of the time I target steelhead, fish are in the pre-spawn mode. Fish are in a holding pattern and the safest place to wait and burn as little energy as possible is in deep, slow moving holes. When water levels are down, finding a deep hole is as easy as putting on polarized glasses and walking the river. This is a really effective scouting method because when water is even slightly murky, even the best glasses won't help. Memorizing the topography of the river, drawing a map, or using your GPS to document depths and structures gives you an invaluable angling advantage. If you don't have time for ground scouting, focus your efforts based on prior knowledge of river characteristics. For example, deeps holes are often associated with outside bends, culvert discharge, or parallel to rock and sheet metal walls. I am a proponent of scouting not only because it ups the odds of catching fish but also because it reduces your chance of drowning. It only took one breathtaking February swim for me to respect the power of flowing water. Pictured are the essentials for catching "chromers." Spawn sacs and Kalin's crappie tubes tipped with MEAT are the author's go to baits, especially in deep water. 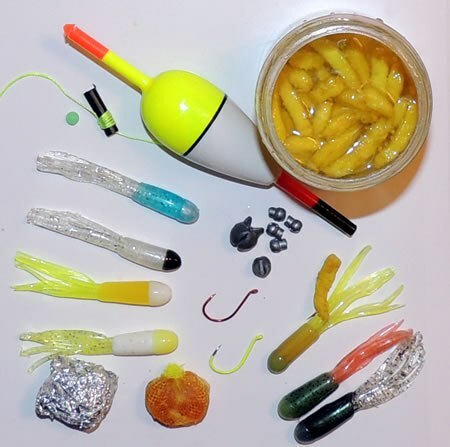 I have found that fishing either fresh spawn sacs or Kalin's crappie tubes under a float (bobber) to be the most effective baits for catching steelhead in deep holes. I usually tip my tube jig with livebait or MEAT Panfish Leeches. Wax worms and spikes work well but easily come off the hook. Uncle Josh MEAT has the scent and taste of livebait, stays on the hook, and you can use colors that match your tube - therefore I prefer to use MEAT. No matter what bait you choose, the goal is for your presentation to stay as close to the bottom as possible without continually getting hung up. Steelhead hug the bottom in deep holes to conserve energy and therefore it is imperative to keep your tube or sac in the strike zone as long as possible for these lethargic fish. To do so, use a slip bobber and set it a few inches less than the depth of the water you are fishing. Next, place a large split shot directly under the bobber so it no longer slips and then continue to put more weights down the line at approximately eight inch intervals until you get about twelve inches above the hook. These split shot should be larger near the float and gradually reduce in size until the last few are the size of a BB. The reason for the spacing of split shot is to get your line below the float to drift as vertically as possible. This allows for quick strike indication and quicker hook sets. I prefer to use a nine foot medium action spinning rod equipped with eight pound test fluorocarbon line for drift fishing holes. The longer rod allows for effortless casts of great distances, helps to hold your line out of the water for a more natural drift, and makes it easier to set the hook. You will get occasional snags when fishing this way if you are doing it correctly. Snags are a good indication that your bait is drifting near the bottom and that is exactly where you want to be. Be sure to set the hook every time the bobber goes under because you never know whether it is a rock or the fish by the rock that took it down. When air, and ultimately, water temperatures begin warming, fish spawning activity increases. Trout move upstream, fan gravel beds, and begin to mate. Fish can still be caught in deep holes but it is often more effective to target spawning structure. Again, scouting is key so that you know where these shallow gravel deposits exist. On streams with little pressure you can easily bounce around looking for fish. Heavily pressured waters limit your mobility and it can actually be advantageous to wait out migrating fish. If the water is warm enough, you can be sure that a ripe female will eventually show up and numerous males will be right behind her. In this situation it is crucial to only hook the males. If you catch the lead female, there is nothing to hold the males in position and your action will be short lived. Spawn sacs and tube jigs still work in these conditions but I also use flies, spinners, and tiny cranks (without a bobber) on my spinning outfit. Fish are fairly aggressive at this stage in the game and getting your bait to stay near the spawning pod for as long as possible elicits the most strikes. Occasionally the situation arises where you can even position yourself directly above the fish and let your bait drop into the pod and keep it in place - be sure to hold on tight! Try out these tactics and techniques this steelhead season and I know you will end up with chromers in your creel. Dave Lorier Dave Lorier lives in Oconomowoc and has been hunting and fishing in Wisconsin since his childhood. Dave earned his degree in wildlife ecology from UW Madison and then went on to work for the Wisconsin Department of Natural Resources in Fisheries Research and Management. Presently Lorier is a high school science instructor and also teaches youth outdoor education courses. Dave enjoys all types of fishing and hunting, especially competitive bass fishing, bow hunting, and ice fishing for bluegills.